We all know by now that Carly Rae Jepsen's "Call Me Maybe" is the song of the summer. But the cupake of the summer? 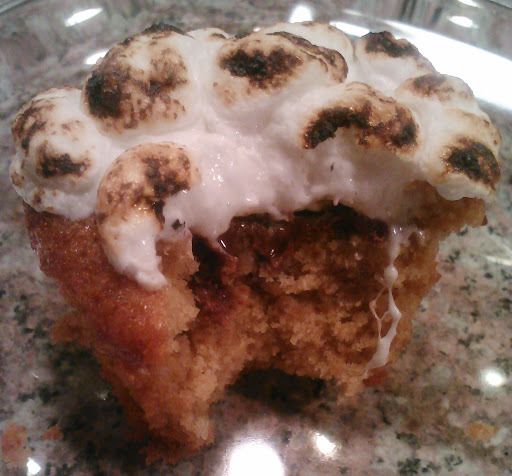 Hands down, it's the S'mores Cupcake. I started with Martha Stewart's recipe for our church's high school girl's retreat - I figured a s'mores-themed cupcake couldn't lose. Martha's recipe, though, wanted you to make a ganache *and* a marshmallow frosting, the kind that requires a candy thermometer. I have nothing against candy thermometers, I just don't have one yet. 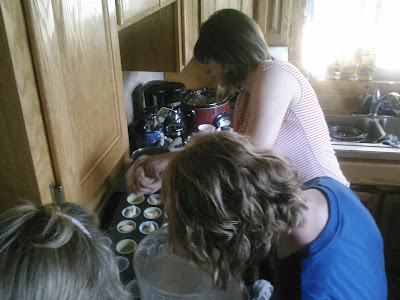 Also, I was making these cupcakes in the second-smallest kitchen I've ever cooked in (first being the one in our Tennessee hotel room, with two burners and only my mini-convection toaster oven to bake with). The experience was a kind of cupcake-boot-camp. Anyway, I stream-lined the recipe. Sure, you could make a ganache. You could also just stick a square of Hershey's into the cupcake while it's warm, and rather than make a marshmallow frosting, top the cupcake with actual marshmallows. The girls did not complain. After making the cupcakes several times, I've gotten the technique and proportions down correctly. First: two squares of Hershey's (and don't even think of going highbrow with the chocolate. If you want to evoke the iconic summer campfire experience, you need the original). More than two is too sweet. Not bad, but too sweet. Second: the marshmallows. I tried puddles of marshmallow fluff, big marshmallows, little marshmallows, and combinations of the three. The best technique is to spoon marshmallow fluff into a quart-sized baggie, cut a *small* bit of the corner off, and pipe it over the cupcakes before sprinkling the mini-marshmallows on. Yes, you can do it with just the minis, but you'll drop a bunch on the floor and make a mess. The fluff gives them something to adhere to. Third: The creme-brulee torch. Did I not mention the torch? You torch the marshmallows. I'm afraid of fire. And matches. And ovens. The creme brulee torch? Loads of fun. They're not very expensive, definitely on the list of kitchen toys to spring for if you're of the mind to do so. They're also good for browning the tops of casseroles if you can't get that one corner to toast right under the broiler, or caramelizing banana slices (more on that in another post). Anyway, a quick back-and-forth motion on multiple cupcakes at a time seems to work the best. Blow out the flames periodically (make sure any loose hair is tied back). 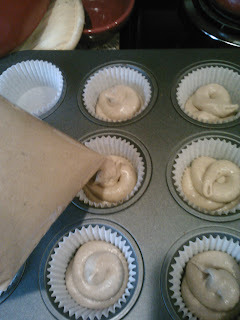 ...and pipe batter into prepped cupcake tins. I love this technique because it makes the whole process so much easier and neater. 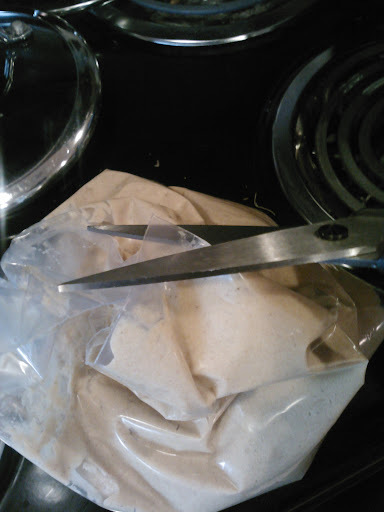 Your cupcakes will come out much more uniform, and when you're done, you can chuck the empty bag. Bake until cupcakes are just done. 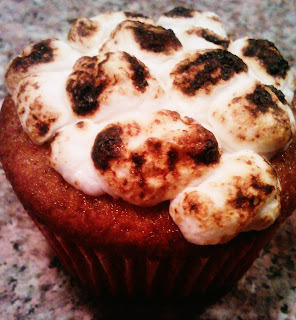 Push chocolates into each cupcake; when cooler, pipe tops with marshmallow fluff and top with mini-marshmallows. Toast marshmallows with creme-brulee torch until you reach your desired level of toastiness (I like them pretty toasted. The burnt sugar flavor keeps the cupcakes from being too sweet, making it easier to eat them in greater quantity). Six eggs? Really? That seems like an awful lot of eggs for cupcakes. What's the reason for it, please? Six is what the recipe called for - it makes for a substantial but moist crumb. You could probably get away with five, but I like the protein of six.